Will A Sailboat Wind Generator Transform Your Battery Charging? There's no doubt that a sailboat wind generator will make a significant contribution to the amps on call-up duty in your battery bank. And the more wind - up to a point - the greater will be the contribution. A wind generator, or wind-charger as they're also known, senses only the apparent wind rather than the true wind, which is why they are much more effective on some points of sail than others. 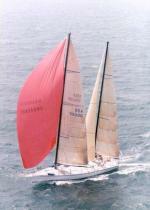 On a typical tradewind Atlantic crossing for example, with the wind astern, their performance is likely to be disappointing. With say a 15 knot following wind and a boat speed of 6 knot, the resulting 9 knots blowing through the blades, your sailboat wind charger won't be earning its keep. But having made your Caribbean landfall and cruising in the West Indies, it will be a different matter. Now beam winds and breezy anchorages will ensure that your sailboat wind generator provides generous and consistent battery charging. The power produced is generated by spinning a DC generator or a 3-phase AC alternator, with an internal rectifier to convert AC to DC. In Europe the trend heavily favours smaller diameter, multi-bladed alternator types like the 5 bladed version shown here. In the US large diameter, two or three-bladed versions still have some avid followers. These types perform better at lower wind speeds - the quaintly named 'WindBugger' or the Hamilton Ferris (shown here) being good examples of the breed. Power produced is a function of swept area blade speed of rotation - and the faster the speed, the louder the noise. So it will come as no surprise that excessive noise can be an issue with some wind generators. The slower two-bladed types producing a low frequency 'whump whump', while the high speed 3 and 5 bladed types can produce a penetrating howl that even a teenager wouldn't appreciate. Manufacturers of the high speed, high efficiency types of sailboat wind generators are at last getting to grips with the noise problem through combining sophisticated blade design with high tech lightweight materials. And your sailboat wind generator will be more effective in some parts of the world than others. In the Mediterranean for example, where calm conditions are frequent, other forms of green power such as solar panels may be a better option. The components of a towed generator, (aka water turbine) are an impellor, 20m to 30m of rotating towline coupled to a pulpit-mounted generator from which a cable delivers the charge to the batteries. Towed generators typically produce around 5A at 6 knots. They really score over their wind driven brethren in light wind conditions or on long downwind passages where a sailboat wind generator would be seriously impaired by the lack of relative wind. In such situations a towed generator will continue to churn out the amps. Sharks have been known to consider the impellor as part of their diet. You should forget about trolling a fishing line when you're towing one of these. The resulting tangle has to be seen to be believed. 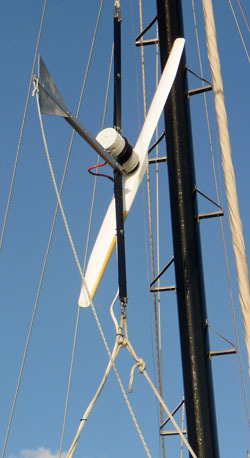 Towed generators are not much use at anchor, but some manufacturers have overcome this limitation by making them convertible from water to wind mode and vice-versa. 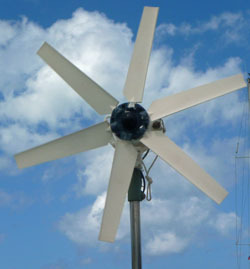 The Aquair 100 water/wind turbine is a typical, much favoured example of one of these. Just occasionally in the marine industry, someone comes up with a really neat idea. This time it was Eclectic Energy Limited, the manufacturers of the innovative DuoGen Combined Water/Wind Generator. 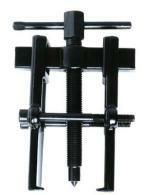 Unlike a towed unit this is a one piece design, which is permanently attached to the transom. Swing it down into your stern wave where it will act as a water turbine; swing it up and you've got a wind charger.